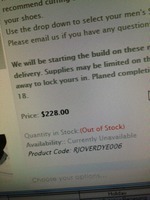 So we opened up the order for the black over indigo over slub yarn jeans. We are only making them right now in the Spikes fit and Viper fit. Trying to do a quick turnaround on the preorder. We already started the cut on them about 12 in each size. Would love for a forum member to wear some so we can see the evo. Ill snap some pictures and post them. I may be interested. I have never had black anything denim. I have had some pretty cool fades with the contest pair, maybe I could get some similar response with these? 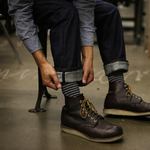 Definitely, check out the recent post of them in the Fades and Wear thread. Fortalitia also has a bunch of photos up on his Instagram. I would love a pair but I just can't afford them every time they pop up for sale. I would be into it, and I'll document the whole thing. They can be my to and from work/weekend jean haha. Hey Steven, did you get my message? ok i pre-ordered them... sent you a pm about it, also placed a comment in the order screen. Oh man. Thats awesome. Yeah. His looks pretty nice. Im going to wear one of these too. any idea on when they will ship? They are nearly done. Im going to have to take a little time to snap a few pictures for sure tomorrow. Got a little behind. We just hired a new guy to help out in the workshop. Sometimes more help is actually more work in tell hey are caught up and trained. But yeah, they are looking great. Ill post some pictures. Must mean we are getting close! Did you shoot any pics before you sent them out? Haha awesome. Yeah they got out looks great. Cant wait to see them pop up on line.